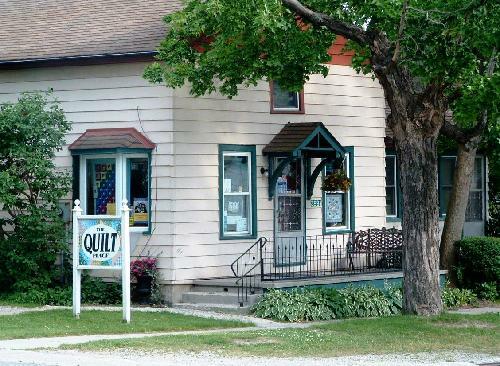 Since 1986 The Quilt Place has been THE PLACE to purchase ALL your quilting supplies. Check our News page for specials and events. We carry over 2000 bolts of fabric, and a large selection of quality cottons, including 1930’s, Asian, batiks, civil war and black & whites. We also carry hundreds of books and patterns including many by Canadian quilt designers. We have ready-made quilts for sale and also welcome custom quilt orders. In 2018 from May 18 to June 18, Quilt artist Henny Bremer will be presenting an exhibit “Sew Little, Sew Much”. Enjoy her latest works along with her classics. You can also view a display of quilts by members of the local Shakespeare Quilt Club “A Personal Touch“. These exhibits are part of the Quilt & Fibre Art Festival Waterloo Region & Beyond (May 22 to 26, 2018). For the non quilter there are also items such as wall quilts, quilted bags, hot pads, and tea cosies that make great hostess gifts as well as warming your heart and home. Our friendly knowledgeable staff is always available to help with any quilting challenge. Located in the picturesque hamlet of Shakespeare Ontario, our shop is open year round.